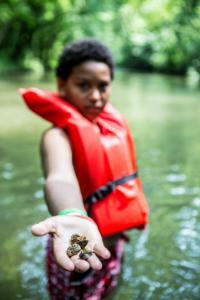 This week-long day camp will provide 9-11 year olds a hands-on environmental science experiences in a natural setting. Using activities from Project Learning Tree and other high-quality curricula, this program will allow kids to explore their local environment while learning about important concepts like water conservation, wildlife diversity, and solar energy. 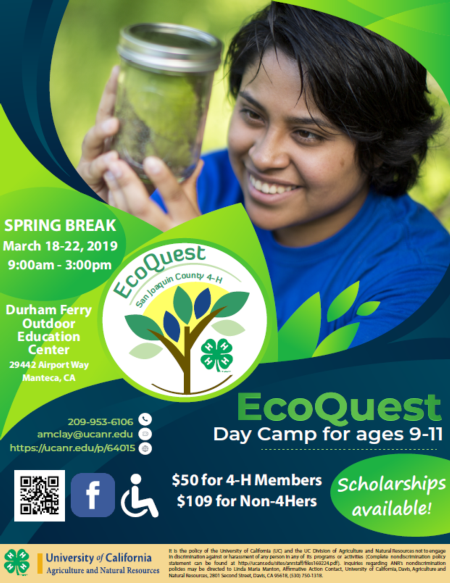 Click here to download a PDF of the EcoQuest Day Camp flyer! The fees cover all activity materials and lunch each day. 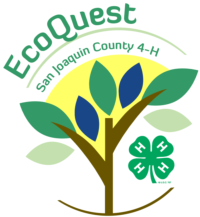 All participants will be required to enroll in San Joaquin 4-H, which has a $59 enrollment fee that gives the youth access to all 4-H activities from July 1st-June 30th, so members can also participate in other county-level activities, local 4-H clubs, overnight summer camp, and more. If a participant has already paid their $59 fee to another 4-H unit they do not need to pay it again. All participants will also need to pay a $50 program fee for the daycamp program. Both of these fees can be waived or the participant can be granted a scholarship if they have financial need. For more information, please contact Ariel Clay at amclay@ucanr.edu. Know Your Environment Scavenger hunt using compasses and handheld GPS units. Water Make your own natural water filter from dirt and rocks. Sun & Wind Build a pizza box solar oven. Trees & Plants Collect oxygen from plants as they use photosynthesis. Bugs & Wildlife Compete in the Insect Olympics! Click here to learn more about becoming an EcoQuest Teen Counselor! A 4-H youth explores a local river. 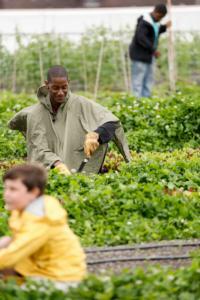 4-H youth doing outdoor activities in a garden. 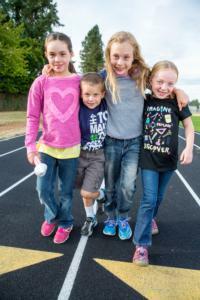 A 4-H Teen Counselor leads youth in a game. 4-H youth work on a crafting activity. 4-H friends hanging out during a break. To register for EcoQuest, please complete the online registration form. You do not need to pay any program fees yet! You will receive an invoice after you register.